These thoughtful tips, tricks, and dinner party ideas from Jason Pfeifer and the team at Manhatta restaurant will help you throw a more impactful gathering. Latest Recipes... To ensure food safety, the FDA recommends cooking seafood to an internal temperature of 145 degrees F or, for shrimp, until “the flesh becomes pearly and opaque.” Meanwhile, in small bowl, mix 1/2 cup apricot or peach preserves, 1/2 teaspoon grated lime peel, 1 tablespoon fresh lime juice, 1/8 to 1/4 teaspoon crushed red pepper flakes. Keep a close eye on the steaks as they cook, looking for that beautiful rose-red meat to turn white about one third the way up from the center of the steak. Once you’ve reached that point, flip and again, ever so carefully, grill until the meat turns white only one third of the way up to the middle and pulls flaky from a fork. NOTE: Avoid cooking the meat white all the way through. Swordfish... Tips and information about how to cook swordfish well. Cooking swordfish is easy if you don't overcook it. If the swordfish is to be cooked on a grill (or grill pan), place fish on grill and cook for 3 to 4 minutes. Turn and cook for 3 minutes more. Cook longer if desired. 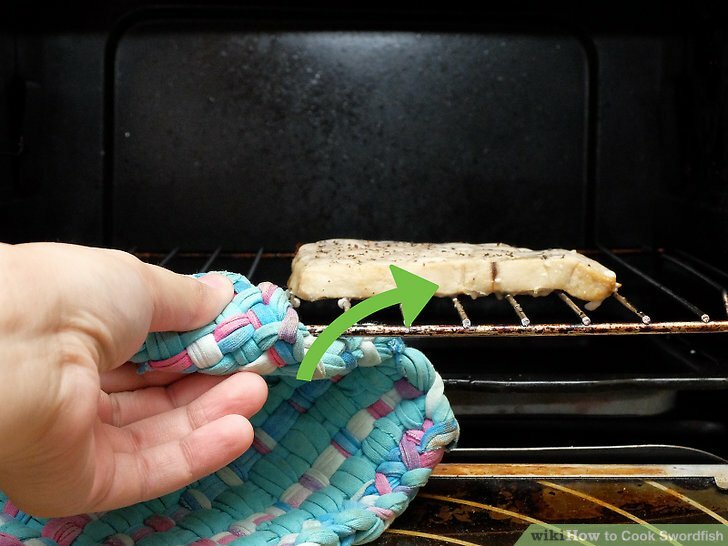 If it is to be cooked under a broiler, place fish on a rack and cook …... If you've had trouble grilling fish before remember to coat the swordfish in oil liberally and allow it cook on one side before flipping over. If the fish won't budge allow it more time to cook before turning. I love swordfish grilled with a little olive oil and Montreal steak spice. All the firm fish are great on the grill. Firm fish like ahi tuna and swordfish can pretty much be treated like really good steak, just cook them carefully because you want them left on the very-rare side of things. 12/06/2014 · This recipe is a really simple, yet incredibly flavorful way to cook swordfish. You may think that grilling fish is somewhat tricky, and that’s true, but swordfish, with its firm, steak-like texture stands up well to this method of cooking and you don’t need to be an expert to have it turn out perfectly. Heat oven to 400°. In a large cast-iron skillet over high heat, heat 2 tablespoons oil. Add fish to pan and season tops with salt and pepper. Cook until fish is browned on one side, 3 to 5 minutes.